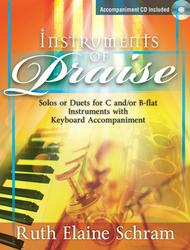 Instruments of Praise (Solos or Duets for C and/or B-flat Instruments with Keyboard Accompaniment). Composed by Ruth Elaine Schram. Woodwind solo. For C instrument, Bb instrument and keyboard. Sacred. Score and accompaniment CD. Published by Lorenz Publishing Company (LO.30-2393L).Conceived with the local church instrumentalist in mind, this resource is a practical and versatile collection of familiar melodies suitable for preludes, offertories, or other special worship music. The supportive accompaniment and accessible instrumental parts enable quick preparation. The flexible options of doing these as solos or duets as well as mixing any combination of C and/or B-flat instruments ensures that these arrangements will be used repeatedly in numerous ways. This is an excellent resource to use with high school players or those adult instrumentalists who do not regularly rehearse or keep their "chops" in ideal shape!